Christine Breese has written over 200 original songs in many styles and each has a dynamic essence of its own. Some are bluesy, some are artsy, some are strange and eclectic, some are rock, some are sweet, and some are other shades in between. She has studied many styles, from classical to rock, ragtime to folk, and fusion to blues. She is also a lead guitarist. If you've ever wanted to see a woman do everything a male lead guitar player can do, from virtuoso riffs to playing guitar behind her head Hendrix style, you are in for a treat! She is s a rare find among female artists. Her influences are Jimmy Page, Eric Clapton, Jimi Hendrix, Stevie Ray Vaughn, Robin Trower, Bonnie Raitt, Albert Collins, BB King,and many others from the classic rock genre and traditional blues. “Listening to Breese, I'm reminded of guitar hero images from yesteryear. From heavy lead driven cover tunes to her bluesy original songs she's an axe playing breath of fresh air...some might say a breeze...I say she's just plain rowdy fun!” —Tom H.
“Christine Breese is a combination of Jimi Hendrix and Robin Trower in a female body!” —Bruce N.
"She's never failed to impress me with her determination to do everything at the highest level. Her music, singing and guitar playing are top notch. Its sooooo cool to hear her music again, and she's better than ever!" —Tom W.
"Her music is an extension or expression of her personality, Harmonious, Articulate, Generous, Innovative, Soulful, Insightful and Joyous.” —William T.
“She is the GET DOWN ON THE GET-DOWN-JAMMIN’ MACHINE!!! I love her music because it's got soul and the best part is her Rang, Funk, Bumpo, Blues Rock! 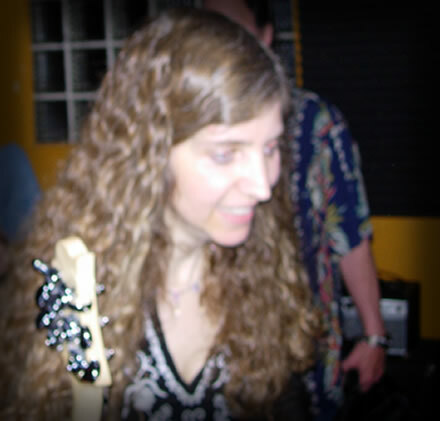 You rock Christine!” —Pat M.
“I never met anyone in person who can play the guitar like Christine. She can make the instrument shout for joy or wail, laugh or cry. It's like listening to a story, or going on an imaginative journey, I am transfixed! Love your songs!!!" —Tracy Ma. "You are a talented, beautiful woman...” —Tracy Mo. "She is a lead guitar goddess! Her powerful playing is complimented by her soothingly soulful voice and original lyrics. She is truly gandahara. The gandahara are celestial musicians who play the music of the spheres." —Kari G.
“Christine Breese absolutely shreds on lead guitar. Her recent work has been highlighted by the dueling leads she plays with a keyboardist who she is clearly comfortable and familiar with. Their back and forth is some elegant showmanship and really keeps the action moving. It's a highly entertaining collaboration. I'm looking forward to the next show!” —Joe S.
“Breese has been a favorite of mine for over a decade! Her songs are full of fun loving rock and inner strength roll… I eagerly anticipate her next tour and release as it is long overdue!” —Blair C.
“I remember when Breese decided she wanted to play the guitar. We both were living in "Pennsyltuckey" at the time, it was the mid-80's. It wasn't long…and from then on she played her guitar like she didn't own it. She was that good. Songs poured out of her and it didn't hurt that she sang as well as she played, and maybe more to the point, her songs had meaning. I first heard her songs in a private concert and I remember that day like it is still happening. I suppose it really is, because her music began to shape her life, or reshape it, and all you need do is look into her eyes while she sings and plays to know that this song is for you. So to all you good folks out there who are fortunate enough to hear her today, I will tell you that she started out this good. And that tells me that it was meant to be.” —Tony S.